I was implanted in 2006 for treatment resistant depression. Due to some concerns I was having about sleep disturbance, and the skepticism of a new psychiatrist, we turned the device off approximately 18 months ago. Two weeks ago I started feeling discomfort in my neck that soon progressed into severe pain. I was given some pain meds by my family doctor, and luckily was able to see the ENT surgeon who implanted the device. He told me that he thought I had an infection and prescribed antibiotics. The antibiotics certainly helped, but I still have a poking or pinching sensation around the base of the coils. After many phone calls, I am finally having diagnostics run on the device tomorrow. I spoke with someone at Cyberonics and they said the diagnostics would let us know if there is a breakage in the lead. I live in a rural area, and the psychiatrist who recommended the device to me is long gone. My current psychiatrist is three hours away, so I most generally only see him via telemedicine. The ENT surgeon is two hours away. Has anyone else here experienced similar pain? My concern is that a piece of the coils or the lead has broken off and is causing this pain. Can the coils be x-rayed to look for breakages? I feel so alone with this. I am so thankful I found this message board. Does anyone know if Medicare will pay for explantation if it comes to that? You don't have to feel alone in this midwestguy, actually a breakage or fracture in the lead causing pain is quite common. A lead check will be done during the unit interrigation. If a fracture is suspected they will take an X-ray as it sometimes can be seen on the film. If there is a break in the lead, it has to be replaced. The diagnostics did not show anything unusual. I don't know what to do now. I still feel as if something is poking me around the coils. Your doctor needs to contact Cyberonics. ASAP It may be the particular model you have, but I suspect it's a minute fracture plus the generator may not be staying off. Is the pain constant or intermittent? sharp? or ache? This is something that needs to be addressed, NOW. midwestguy, try holding the magnet on the device to see if you get any relief from the poking. Thanks for the replies. My implant is set to 0 ma output. Just to be sure, I've tried the magnet and it has no effect on the discomfort I am experiencing. What is the fracture that you are referring to? A fracture in the insulation or the wire itself? I have an appointment with my psychiatrist on Tuesday. Right now, the pain is like an ache or burning sensation. It seems to fluctuate, but never fully goes away. The antibiotics definitely helped, but something still doesn't feel right. HI Midwestguy! WELCOME to the board! Glad to have ya here and hope we can be of assistance to ya! I have heard about the sensation you are having. If I recall correctly, one outcome was the area around the vagus nerve was infected and inflammed. Another situation turned out the coils were wrapped too tightly. There was a recall on leads after 2006, I think the 302 models #. I did have that pulling/stinging feeling and sometimes still do-it is in my case most likely from the 2 surgeries and the nerves being cut. Again, a BIG WELCOME!!! and plz let us know how things are! PS: Wanted to add I had neck issues also from the way my neck was positioned for both surgeries. I went back to my family doctor today for more antibiotics. Tomorrow I am seeing my psychiatrist. The first round of antibiotics helped, but as soon as I was out of them the pain started flaring up again. Tomorrow I am going to call Cyberonics and try to find a surgeon or neurologist closer to my area. I'm just about ready to drive to a bigger city and check in to the emergency room. I have another appointment with the surgeon on Wednesday. Until then I'm just trying not to move around too much, and taking the meds. Hopefully the surgeon will have some ideas about how to fix this. You need to be on some kind of pain killers. I understand that kind of pain, it's horrible. I now have a pain management doctor and we work together to ease mine but it's hard to control my fibromyalgia and RA. There are any number of reasons for your pain. I've been doing some research as to what may be the cause. Here are some images of the electrodes. They might give you a clue as to the pain. I have no doubt in my mind the electrodes are the cause. I think Dennis has even posted MAUDE Reports where the electrode have "fallen" off the nerve. This photo is very interesting , wish I could have found a larger image. If your VNS is turned off you need to go somewhere that they know what they are doing and I have found that the emergency room is not the place, and I live in a big city! Thanks for those images, and the support. Do all versions of the lead have the anchor, and two electrodes? I can see and feel only two bumps under my skin. This makes me wonder if the surgeon left the anchor out for some reason. The problem seems to be with the coil that is the lowest on the nerve. If I pull on my skin slightly, I can see it move around, while the upper bump remains stationary. Perhaps the electrode or part of it has pulled loose and it's poking the nerve. If the electrodes are that loose, I suppose it's good news if explantation is necessary. The latest development is that my left arm feels as if it's going numb. Occasionally I feel pain in it. My psychiatrist told me that he didn't think I should be too worried about this right now, because it could just be from the nerve being pinched or irritated. I'm just trying to remain positive until I can meet with the surgeon on Wednesday. I'm also hoping that if he decides to perform surgery I won't have to wait too long for it to happen. I can't do much of anything right now because moving around a lot makes the pain worse, and taking the pain meds makes me so sleepy. My vns was causing shooting pain and numbness down my left arm with each stimulation. I told my neuro to turn it off. The Rep from Cyberonic$ was livid. He just wanted to change settings and tried to tell me it wasn't the vns causing the problem. I stood my ground and insisted it be turned off and that I was going to keep it off. Both the Rep and Doctor were not happy with my decision. No bonus in their paycheck that week! I made the right choice for me. Please keep us up to date. I just don't understand how a doctor can allow any patient to suffer with such pain. Everyone passing off responsibility, see the programmer, no see the surgeon, no see the rep, no see your GP no go to the ER. If even 2 of the professionals got together, they could work out a treatment plan. The surgeon ordered a CT scan of my neck. They said it would take a day or two to get the results from the scan. I have another appointment in two days. The good news is that I was able to make it through the day without taking any pain meds. The CT scan didn't show anything unusual. The surgeon told me he is "not convinced" that the implant is causing my pain. He told me that he isn't comfortable doing surgery because he isn't sure what the problem is. He suggested that the pain is neuralgia. He then referred me to a neurologist, and I only have to wait THREE MONTHS to get in to see him. So, I'm basically back to square one. I suppose I should be relieved that the scan didn't find anything. I will be making some phone calls on Monday to try to get an earlier appointment with a neurologist. Now why doesn't this surprise me? I've heard it 100's of times before. The surgeon told me he is "not convinced" that the implant is causing my pain. 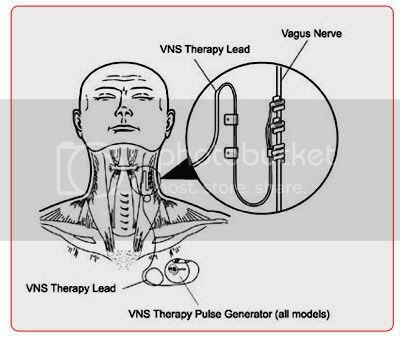 The vns CAN and DOES cause pain and problems to the vagus nerve and other nerves close by. You bet! Nerve damage from the vns. They are "not convinced"??!! Well how in the hell did the nerve get damaged in the first place? If the vns had NOT been implanted, would you be having this issue now? I very seriously doubt it! Today I was able to get an appointment with a different neurologist. Now I only have to wait one month instead of three. Birdbomb, I sent a question to you via private message. I think Dennis has even posted MAUDE Reports where the electrode have "fallen" off the nerve. The implanting surgeon indicated that the reason for replacement was that the lead had "slipped off the nerve". I think you might want to call that dr.'s office every morning and see if any cancellations can fit you in. I just hope your neck isn't getting fried. Hope you can get in sooner midwestguy! Yes, they always say it isn't the VNS when that's the 1st thing these docs need to rule out. I am so glad you've had these scans done, in the same respect, it would be quite hard to determine if the coils are wrapped too tight by a scan--it's a need to see it for oneself kinda thing looking directly at it all in surgery as I was told by my explanting neurosurgeon. Thinkin' 'bout ya! Be well! Thanks. I have an appointment with my family doctor on Monday. I think I'm going to ask her if she will do an xray to see if the coils look normal. I saw an xray online that showed a coil that had been pulled out of shape, causing it to compress the nerve. I don't seem to be getting any worse, so I suppose that is good news. I'm just hoping the neurologist will have some idea about how to remedy this situation. My fear is that he will refer me to yet another doctor and I'll have to wait weeks or possibly months yet again. I wonder if you should ask him for a nerve conduction study. It might help. I've had them done for my arms and I'll not kid you they hurt but it show how much function is there. I saw the doctor today. She gave me some more pain meds and some samples of Lyrica to try. She told me to give it about a week and see if the pain improves. I have an appointment with the neurologist in three weeks. She said it's possible that the nerve has been stretched a little and is causing the pain. Good! Your doctor believes you do HAVE nerve pain and possible damage. She sounds like a keeper. My pain management doctor prescribed Lyrica for me last month and I have seen an improvement. Highest co-pay I have ever had. Yay midwestguy for good results with your doc!!! Hope the Lyrica will be a success for you, and Birdbomb too! I had some success with that drug for neuropathy. It did work for a bit, then increased and worked for a bit, then the highest we could go with some success, then it stopped working for me just like most other prescription drugs. Please though talk with your doc about your VNS before a nerve conduction study like should the device be off with the magnet or set to 0ma at the docs office then turned back on afterwards. Cyberonics has a clinical tech support team that are supposed to talk with docs about stuff like that. I'm kicking myself now for not asking the doctor to order an X-ray of my neck. I'm really starting to wonder if the surgeon implanted the electrodes upside down. In every image I've seen, the wire clearly enters the anchors from the top, and exits the bottom. Under the skin in my neck, I can clearly see that the wire enters the anchors from the bottom and exits the top. It then curves over and goes deeper into the neck. Maybe the surgeon didn't leave enough slack in there and it's tugging on the nerve. I found an image in the brochure that shows it the way I have it in my neck, so maybe it's okay. Who knows. I'm tired of trying to guess what the problem is. The not having enough slack could be the problem...hhhmmm...I'm stumped. I think it is really sad that the patient has to figure it out why they don't feel good-that's nonsene. Hi again folks. I just wanted to give an update. I've now started taking Prilosec. I was waking up in the night with my stomach gurgling and churning like crazy, and having some acid reflux. I have also had some periods where my mouth seems to produce an endless stream of saliva. The tingling in my left arm has gotten better, but it comes back occasionally, especially in my forearm and hand. I have had some nasty ear aches in my left ear. I took the Lyrica for a couple of days, but it made me feel really strange and so sleepy that I quit taking it. I might start taking it again though, in hopes that it will stop the pains I am having. Riding in the car seems to make the pain in my neck flare up a lot more. I think all of that moving around is causing the coils to rub on the nerve and irritate it. I just hope that the neurologist I am going to see will take the time to try and help me. I really don't want to have another surgery unless that is my only option. At the same time, I'm worried that just trying to cover up the pain is going to allow more damage to occur. I'm seeing the psychiatrist tomorrow. We cut my meds down a lot over the summer, but I'm going to mention to him going back on something to help me get through this emotionally. Right now I am only taking Lamictal, and Ambien to help me sleep through the night. I've also read that some antidepressants can help with nerve damage, so I will see what he thinks. Thanks again to everyone here for the support.